After a couple of days at the breathtakingly large Grand Canyon, we were ready for something smaller and more intimate. 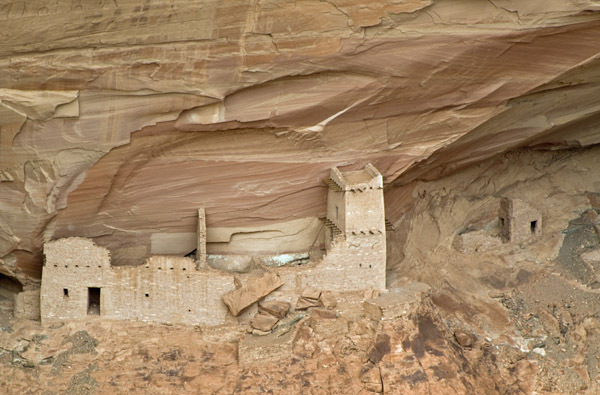 If visiting the Grand is like going to a huge metropolis (complete with teeming sidewalks), Canyon de Chelly (“Canyon d’SHAY”) feels more like a quaint town. It is so cozy that you can explore the entire area in a single active day. 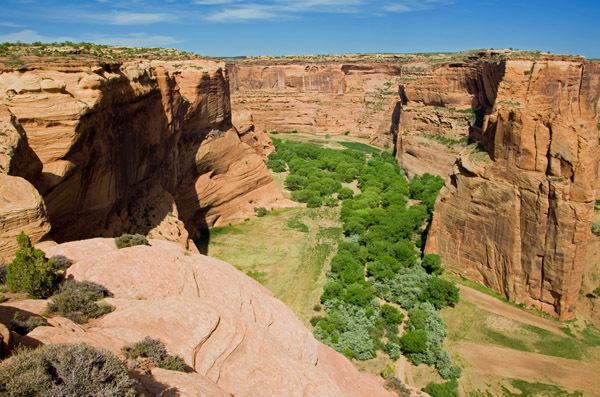 You access the bulk of Canyon de Chelly via two scenic drives along the North and South rims. You can visit all ten overlooks in about four hours. Budget more time if you want to while away an afternoon basking in the beautiful canyon scenery. We were immediately struck by the greenery of Canyon de Chelly. Ribbons of lush trees decorate the canyon floor, in stark contrast to the dryness we found both at the Grand Canyon and in the nearby Petrified Forest. It’s no wonder that generations of Navajo have farmed these fertile grounds. But the real treat here are the ancient Anasazi structures still standing throughout the park. The most impressive are those of Mummy Cave, named for the two mummified bodies found there by an archeological expedition in 1882. The ruins tucked inside Mummy’s two adjacent caves are the oldest uncovered in the park. Some are believed to have been built around 300 A.D. The magnificent pueblo that bridges the two caves was probably the last structure built in the complex around the 1300s. Canyon de Chelly is a unique National Monument in that it is entirely comprised of Navajo Nation land. The National Park Service and Navajo Nation work together to manage the park’s resources, but because many Navajo still reside in the canyon, visitor access is limited. The two scenic drives are open to the public and free, but backcountry hiking or driving in the Canyon requires an authorized guide and permit. Visitors can purchase tours and schedule ranger led hikes at the visitor center. We chose to avail ourselves of the one and only self-guided hike at the park instead. The trail to White House Ruins descends 600 feet to the canyon floor on a steep, rocky path, through a series of switchbacks. 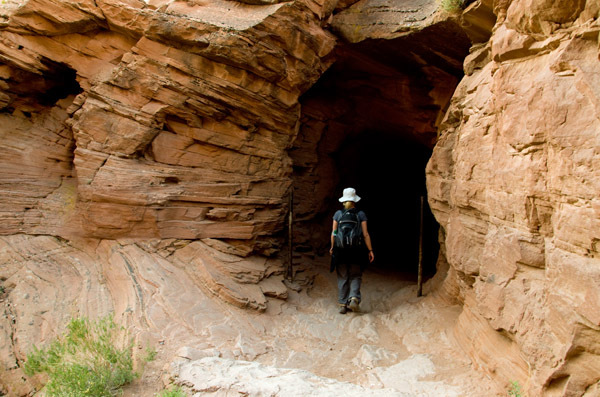 We passed through tunnels and along interesting canyon geology on our way down. The round-trip hike took us about two hours. We set out early in the morning and are glad we did. Not only did we avoid hiking in mid-day heat, we also missed the jewelry sellers and touts whose folded up tables were as quiet as the ancient relics. Canyon de Chelly is located in Northeastern Arizona, outside the town of Chinle. Primitive (no hook-up) camping is available inside the park. Other accommodations are available in town. This is one area I never have been to but has been on my list for a while. It’s pretty convienient to Petrified Forest and also to Monument Valley in UT. Not a bad road trip to hit all three places. That’s exactly what we did when we were there. Great post! Trying to get our heads round the size of these ruins. They look like scale models but starting to realise quite how enormous the rock face is. Wow! Beautiful photographs. It’s true that they look like little toys. Unfortunately, there isn’t anything in any of the frames to give perspective. For the most part, these things are off limits to tourists so you don’t even see people in the shots to get a sense of size. But people really did live in these structures, at one point. So that gives you some indication how big those cliffs are. Wow, indeed. Been wanting to visit the Canyon de Chelly since I first saw them in Edgar Payne’s paintings. Thanks for sharing. This place is climbing the charts on my travel list. Cheers. Wow. Nice story. Thanks for sharing. WOW, WHAT A TERRIFIC PLACE!! THANK YOU SO MUCH FOR INTRODUCING IT TO ME. SUCH PLACES , I THINK, HAVE STORIES THEY CAN TELL US IF AND WHEN WE ARE READY TO LISTEN. LOOKING AT THE PICTURES IN SOME WAY MADE ME THINK OF E.M. FORESTER’S BOOK A PASSAGE TO INDIA. VERY INTERESTING BOOK AND LIKE YOU PLACE , FULL OF MYSTERY AS SUCH A PLACE HAS TO BE. THANK YOU ONCE AGAIN AND KEEP UP THE GREAT WORK!!! My family and I went on a vacation out West when I was younger – Utah, Colorado, Arizona, and New Mexico. Canyon de Chelly was my favorite place that we visited! Tons of great stuff in those states, and throughout the U.S. We’re glad to have the opportunity to get out and explore so much of it. The scale and beauty of that site is just impressive. Thank you for sharing, Brian. Amazing! I have been dying to go there for years. Your pictures were gorgeous! Thanks for the complement and for stopping by our blog. Good point — and critical distinction. You’re right. I’m taking a trip. Soon! I would trade ten years off my life to go back in time and watch those people BUILD that town. Beautiful images. Canyon de Chelly NM is one of my favorite destinations in the Southwest. Isn’t it just amazing there! As a “professional” wanderer for many years, I like your blog very much. Feet, don’t give out on me now! My favorite place in Arizona-great capture of the scale. 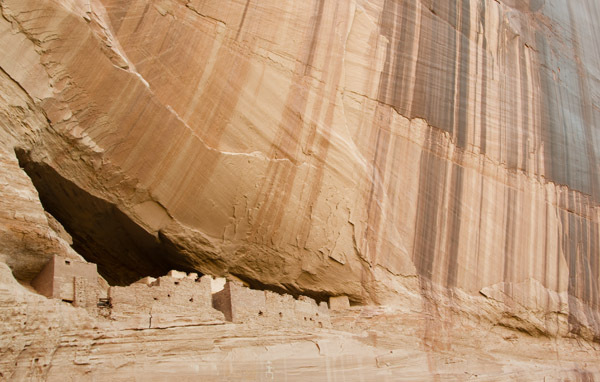 I love Canyon de Chelly…we hiked down one January day, crossed the frozen creek and to the base of the White House. Same trip we hit Chaco Canyon, Arches, and Shiprock. Breathtaking pictures. Never quit doing what you love to do, you’re truly inspiring! Yes, I think you probably could tour the ruins back then. 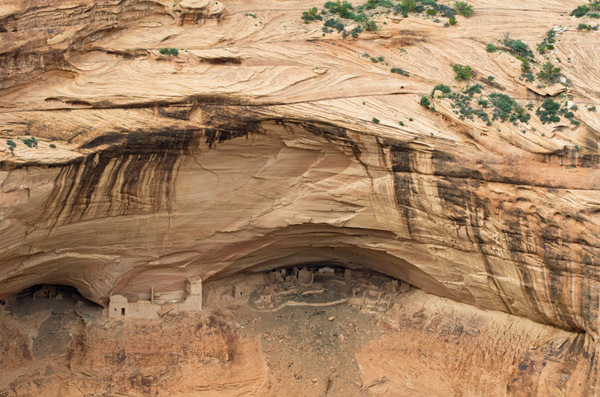 But there are several similar cliff dwellings throughout the Southwest so it’s also possible you remember someplace else . . . memory is funny that way. In either case, these are pretty special places. Very impressive, the colours are so amazing. Thanks for sharing. I’ve never been there and will probably never make it. Your pictures are my only view into the canyon. I have a watercolor painting of the Pueblo between the caves hanging behind me on my office wall. Thank you. And we’re delighted to offer you some armchair travel. I visited the Grand Canyon and Canyon de Chelly in June 1994, and will never forget it. The Canyon de Chelly is such an intimate experience and mysterious. I loved it. Congrats on being Freshly Pressed — and for introducing people to it. Yeah, we really liked the more “intimate” size of CdC. Especially after coming from the Grand Canyon. Wow. Reminds me of Mesa Verde. Amazing engineers. It’s quite similar, although Mesa Verde is far larger. We’ll have some stuff to say about that National Park soon too, so stay tuned. What I will never forget about Canyon to Chelly is the silence. No car sounds, no birds, no machine or people noises. Absolute silence. Ah the American Southwest! Another place I would like to visit eventually. 🙂 Thanks for sharing! It is really lovely country out here. So jump on in, the water’s fine. great ! Looking forward to visiting that in August all the way from the Philippines. I might only visit it once, but I’ll definitely visit your site often. Congratulations on making it on freshly pressed, twice ! That’s a nice trip from the Phillipines. We hope to get your way soon, but don’t know exactly when. Beautiful area. Went there many years ago but would love to take another trip. Love the photographs. This is breathtakingly beautiful! I’m visiting the Grand Canyon for the first time in about a month, I’m hoping to have a look around and take some similarly beautiful pictures too. Thanks for sharing! Such a beautiful place. enjoy! I live relatively close and would say this is indeed a magical place. Love your blog and aspire to have as many adventures before the big door closes on me. cheers! Wow! The canyon looks amazing! You have great pictures in this post. Looks as though you and I have captured many of the same shots from many of the same vantage points for Canyon de Chelly. Great news travelers are coming here, and thanks for reminding me how great this place is. Also check out Mesa Verde, which was the center of the Anasazi Universe. While Canyon de Chelly does get a steady trickle it is WAY behind the famous SW parks. I even took awhile to get here, and I consider myself a “Western guy”. If anybody wants to do a Navajo-led tour, and is okay on a horse, I would highly recommend taking a Navajo-led horse-camping tour in the canyon. We did two nights, which is perfect to explore most of the canyons (there are really two). You are in the company of Navajo guides and you check out places no other tour goes to. We actually chased and tried to catch a wild young stallion on horseback (he escaped at the last minute with a tremendous leap). The Navajos do catch wild horses in the upper canyon, then within a day they have them broke to ride. They’re amazing horsemen. Sorry so long. Thank you for the beautiful photos! I’ve read a lot of Tony Hillerman books, many of which refer to Canyon de Chelly. Now I can picture in my mind what it looks like when the characters in these books go into this area. Haven’t read any of his stuff, but maybe it’s time I fix that. Thanks for the reference. It definitely is time you fixed that! Really good page-turning detective stories with Navajo police officers. Incredible photos! Thanks for sharing. How “in shape” does one need to be for this hike? Steep to me reads, very good shape! It’s a 600 foot climb over maybe a half mile of trail. So it’s pretty steep, but also fairly short. It’s a trail I think most folks could tackle, it will just take some longer than others. Too bad! We missed this one when we drove through AZ last year on our way to Mexico. Looks awesome. Arizona is a great state. Wow, I had never heard of this place. It seems similar to Mesa Verde yet different, special. Great photos. I have to see this with my own eyes.